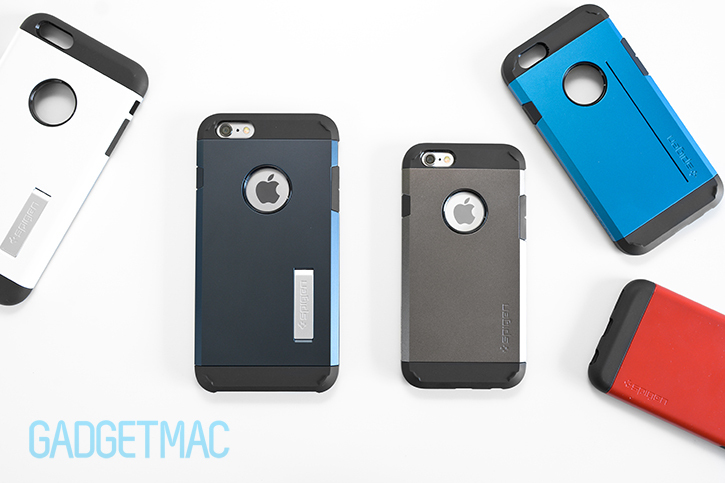 We've recently looked at what Apple had to offer with its minimalist Silicone Case, and now it's time for us to step things into third party gear with some Spigen case goodness for the iPhone 6 and iPhone 6 Plus. In particular, Spigen's toughest series of cases – the hugely popular Tough Armor and Slim Armor series of sensibly priced iPhone 6 and 6 Plus cases. If you're looking for a drop protective case, this insightful review will hopefully make your buying decision easier than ever. So what are you waiting for, the full review is waiting for your after the break! If you've ever used Spigen's Tough Armor cases for the previous iPhone 5 and 5s, or even the iPad mini, then for you this will be a very familiar case experience going into the iPhone 6 and 6 Plus territory of protection. Spigen has done little to no redesigning of its Tough Armor and Slim Armor series. They're both still very much the same kind of dual-layer protective cases you've come to know and mostly love, only at a noticeably slimmer profile to coincide with the all-new svelte design form factor of Apple's iPhone 6 and iPhone 6 Plus smartphones. Which also means that you're still going to be getting that same level of awesome drop protection, only now with an even slimmer design that feels better to hold despite that larger form factors of the newer 4.7-inch and 5.5-inch iPhones. We noticed that Spigen has marginally increased its online retail pricing of its most popular cases for the iPhone 6 compared to previous iPhone iterations, however, the company continues to offer its entire iPhone 6 and iPhone 6 Plus case lineup at significantly discounted pricing through Amazon, where it has to compete against a slew of other brand rivals. While Spigen's Tough Armor case for the iPhone 6 and 6 Plus retails for $35 on Spigen's own website, the same case typically sells directly by Spigen for as little as $15 on Amazon - if you keep your eyes open for a good deal that is. Specific colors are also the deciding factors of what ends up being the cheaper alternative. That said, it definitely pays to shop around. Spigen's Tough Armor is the seemingly the company's pride and joy form of case protection as it offers the most drop protection out of all the Spigen cases. It's also designed to stay as slim as possible yet provide the same level of protection you'd get with much bulkier OtterBox cases. Air cushioned corners form a concealed pocket of air in order to help absorb corner impacts more effectively and help reduce the amount of shock transferred to the device. The same type of feature is also found on the Slim Armor case, which is insignificantly slimmer and rounded by design compared to the more angular styling of the Tough Armor case. 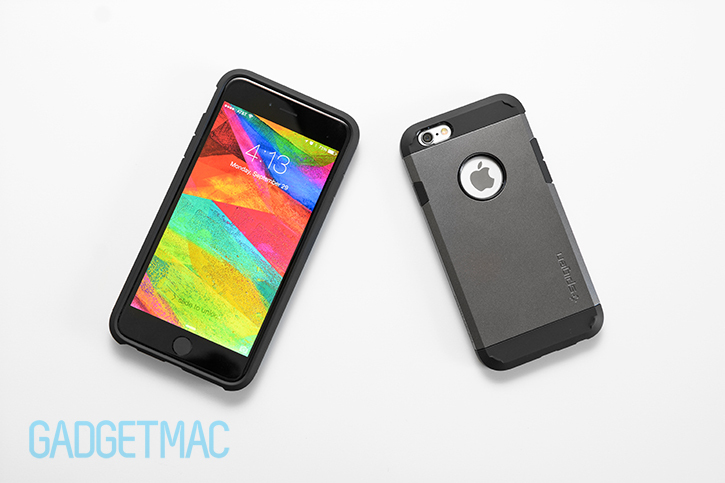 The Slim Armor is made using the same dual-layered hard and rigid polycarbonate exterior mid-section frame attached onto a shock-absorbing and flexible TPU body, however, the design compliments the roundness of the iPhone 6 and 6 Plus giving you that familiar feeling of holding onto a sleeker shape. That's great and all but there's one caveat, and that is the fact that the Slim Armor lacks grip. It's more slippery to hold than the flat edges of the Tough Armor, and for that reason we prefer the Tough Armor's angular shaped form factor a lot more. If you're using an iPhone 6 Plus you should really avoid the Slim Armor at all cost as it makes the device even more unwieldy for use with one hand. 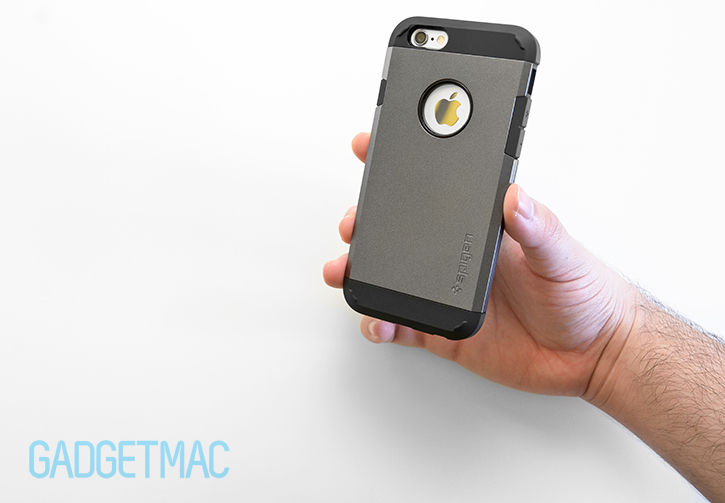 Now on the Tough Armor and Slim Armor cases for the iPhone 6 Plus, Spigen has gone the extra step in including an integrated kickstand and for good reason. We all know that with a large display such as the one found on the hugest iPhone ever made, consuming content is something every iPhone 6 Plus user is going to go through by the gigabytes on a daily basis. 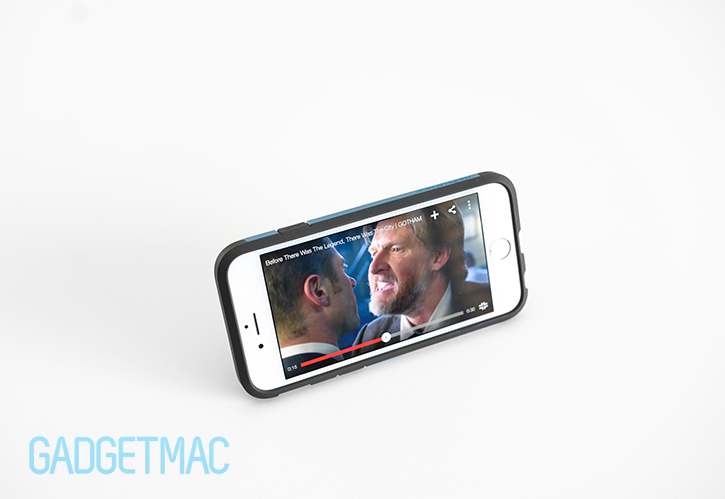 So viewing content like movies and YouTube videos with such a large device requires a bit of additional help from a stand, and what's more convenient than having a flip out kickstand seamlessly integrated on the back of your highly protective case. Both the Tough Armor and Slim Armor cases feature a kickstand that is unobtrusive and does a great job supporting the weight of the case and the iPhone 6 Plus surprisingly well consider its a somewhat cheap piece of plastic that doesn't lock into position when it is flipped out. And while it is plasticky, it does convincingly look like a piece of aluminum. It securely snaps flush into the back of case and fortunately doesn't rattle when not in use. The stand isn't angle-adjustable and is fixed, however, you can flip your device around for a lower viewing angle tilt depending on how close you're sitting in front of your device. The built-in kickstand serves its intended purpose quite nicely. That said, I can't help but feel like Spigen could have done a much better job with the build quality of this kickstand functionality, which is a bit of a shame. When it comes to the finish of the case, the Tough Armor comes in three different types of hard plastic finishes depending on what color you choose. Colors like the gunmetal, satin silver and electric blue all have a very fine metallic finish while other colors are more solid. The black Tough Armor is the only version that features a hard polycarbonate mid-section piece with a matte, soft-touch finish coating that gives the case a little more grip compared to the rest of the colors, but will also easily show fingerprints. So keep that in mind when picking a out a color for the Tough Armor iPhone 6 or iPhone 6 Plus case. For reference, the white Slim Armor case we have here has a smooth pearlescent white finish that is semi-glossy and not rubbery in texture. Neither of these cases that we have gotten to review are grippy in texture, and still they aren't as slippery as the bare aluminum of the iPhone. Sadly the Slim Armor does not come in the same soft-touch rubbery black finish that the Tough Armor case does and that really does not make any sense considering it is the least grippy of the two models. Spigen's attention to detail makes the Tough Armor case a real pleasure to use, and if the beveled edges front to back wasn't enough, the Tough Armor's neatly tapered lip around the iPhone's glass display forms a protective perimeter that lifts the touchscreen away from a surface whilst maintaining comfort. Since everything has been taken into slimmer consideration, the iPhone 6 and 6 Plus Tough Armor case features a shallower 0.6mm raised bezel around the front of the iPhone compared to the iPhone 5/5s version of the Tough Armor, which featured a much more substantial 1.5mm raised bezel. The same reduction in thickness can also be found when comparing the iPhone 6 and 6 Plus Slim Armor with the iPhone 5s variant. This means that it isn't likely that the Tough Armor and Slim Armor cases will protect most applied tempered glass screen protectors from from coming in contact with a flat surface in the event of a drop or when intentionally setting the iPhone face down on a table. Though it's important to note that Spigen's ultra-thin 0.4mm GLAS.tR Slim will technically leave a 0.2mm clearence of screen protection when used with the Tough Armor case. 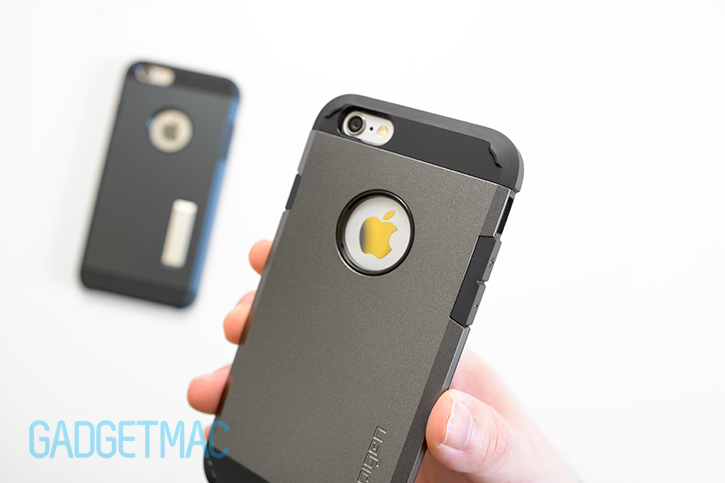 Although the regular Tough Armor case for the iPhone 6 does not feature a built-in stand like the Plus version, there is an alternative for you if you still want a similar stand functionality for your iPhone 6. 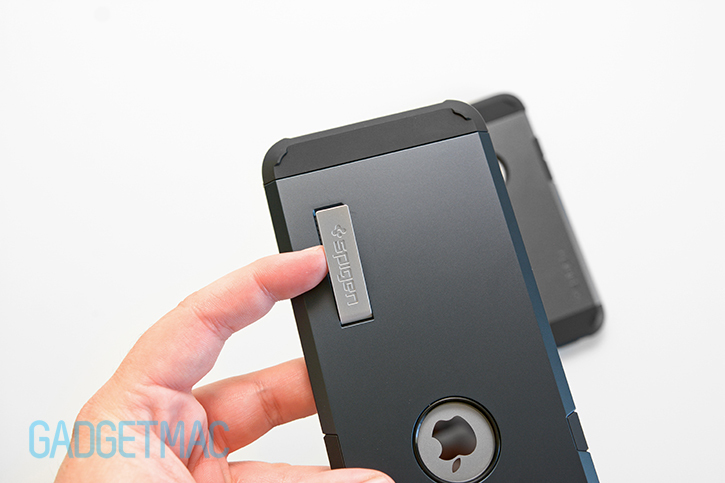 Spigen's so called Tough Armor S case is an iPhone 6 exclusive case design that features a shallow slot on the back that allows you to use any regular sized credit card as an impromptu kickstand. There's even a Spigen credit card-like plastic card included so that you don't have to use your own credit card. 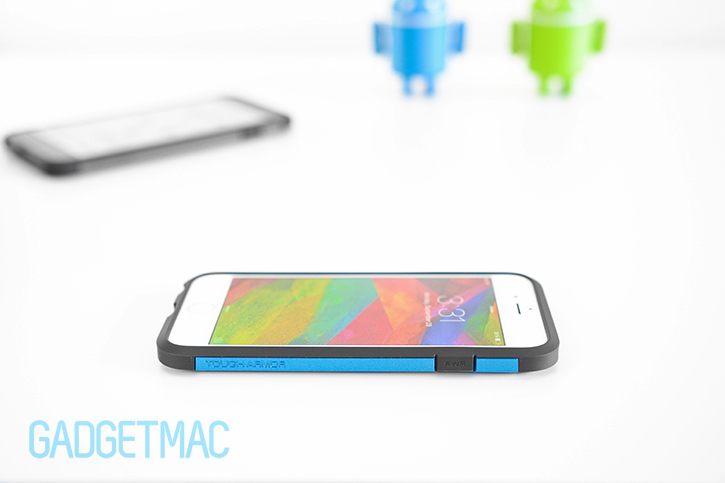 The Tough Armor S is essentially a Tough Armor only with a kickstand slot on the back. 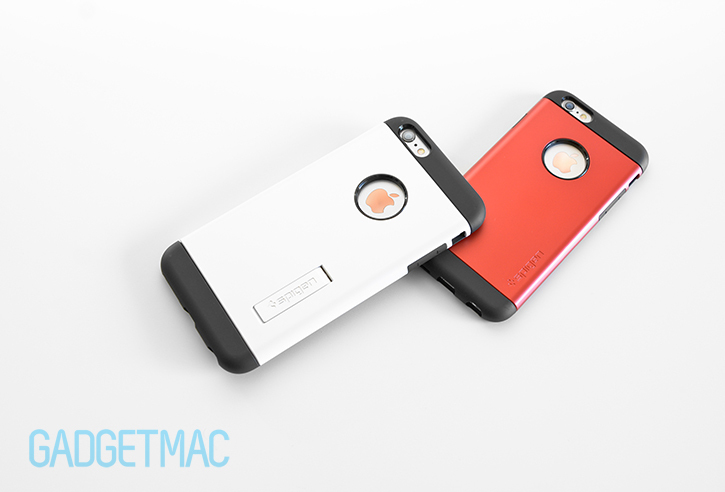 It offers the same exact protections as the regular Tough Armor case, and it's also costs just as much. The way this works is very simple. Just stick the end of the card into the slot on the back of the case and you've got yourself a hands-free viewing stand. And like the Tough Armor case for the iPhone 6 Plus, you can use the kickstand card to position the Tough Armor S in the same two viewing angles, which are nearly identical to one another in terms of angle degree. There's also a Slim Armor S variant for the iPhone 6 with the same kickstand card functionality in case you prefer the well-rounded design of the Slim Armor series. Personally I think that the Tough Armor series ironically provides a more comfortable experience when held. 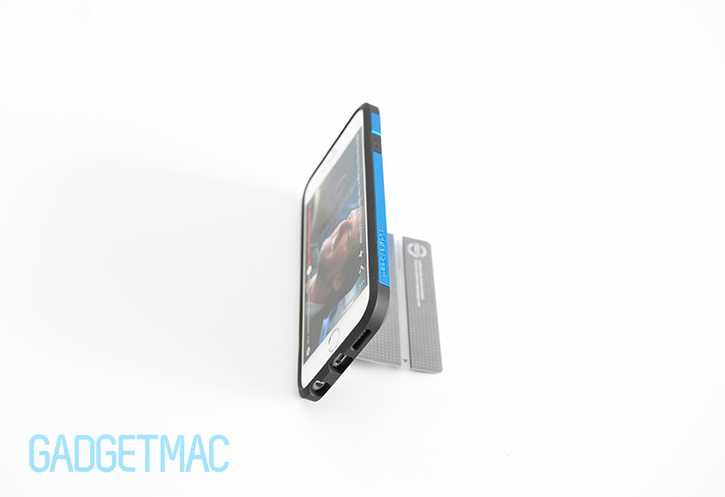 The kickstand is stable enough on a flat surface to a point where you really wouldn't be able to tell the difference between the built-in kickstand of the Tough Armor case for the iPhone 6 Plus, but moving the iPhone just a little will cause the card to fall out of the otherwise extremely shallow slot on the back. It isn't as convenient to use as the iPhone 6 Plus version, but as an option at a similar price point we can't complain. Of course the biggest caveat to the Tough Armor S case is that you will need to carry the included Spigen card separately as it cannot fit inside of the case itself when not in use. Or you can of course use one of your own cards that you carry with you anyways inside your wallet. On the left side we have a very narrow opening for the mute/silent switch that does require a finger nail or very delicate fingers to reach through the cutout. Underneath are the Tough Armor's integrated TPU covered volume buttons, which aren't as tactile and easy to press as the iPhone 5s version of this case. The same type of covered sleep/power button can be found on the right side as well with a 'PWR' description inscribed on the surface for that extra visual detail. More force than usual is required to press on the Tough Armor's integrated buttons, but nothing that we would consider to be a deal breaker of an issue. 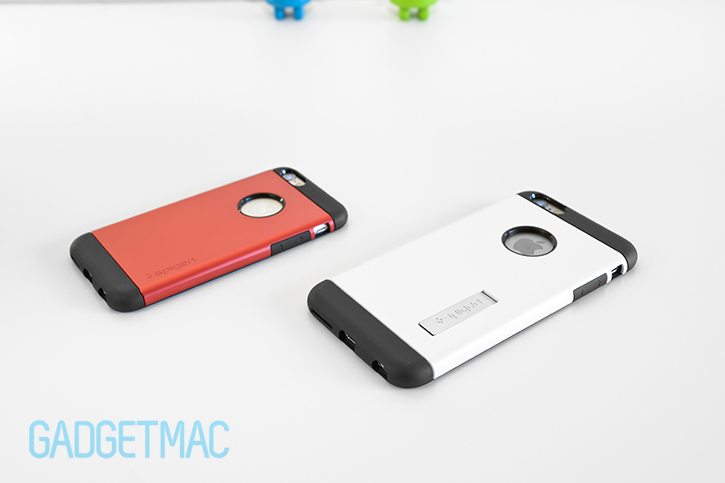 When looking at the slimmer of the two cases, the integrated control buttons on the Slim Armor have a very similar tactile feedback when pressed through the TPU materials, except they're differently designed to match the rounded shape of the Slim Armor styling, which is simply more streamlined and cleaner than the Tough Armor's more rugged design language. Spigen wasn't messing around when it designed the Tough Armor's bottom port, speaker and mic openings. Despite looking like it's a tight fit, the Lightning connector port opening is large enough to fit practically every third party Lightning connector cable. These cases will easily enable you to dock your iPhone 6 or iPhone 6 Plus on compatible charging docks with an adjustable Lightning connector adapter such as the HiRise dock stand by Twelve South. I was also glad to find out that I was able to plug any straight and L-shaped 3.5mm headphone plug through the headphone cutout of both the Tough Armor and Slim Armor cases including my Audio-Technica ATH-M50x. Granted there are still many 3.5mm audio plugs that won't fit. As expected, the pill-shaped back-facing camera opening on these cases has been properly outlined so that it does not interfere with the True Tone dual LED flash. It's hard to imagine how it can stack up against a case such as the OtterBox Defender, but what you can't see is the Tough Armor's reinforced TPU interior corner protection. Spigen calls this its air gap technology which essentially leaves a pocket of empty crumple zone that when hit upon impact, the corner will act like a bumper in that it'll absorb the shock by flexing before it reaches the iPhone. When corners are most susceptible to first contact when dropped, it's really an important area to focus on and we're glad that Spigen has put effort in creating such fantastic reinforced corner protection into their elite series of drop-protective cases. While it isn't going to be called a slim case by any stretch, it's also not at all the sort of drop-protective case that you'd call bulky. Spigen has done enough with the design here to convey a sense of comfort with the tapered edges and well made materials that provide you with a nice amount of grip and a pleasant feeling when holding the case in your hand. At a side profile, the Tough Armor is even noticeably thinner than the UAG Composite case by Urban Armor Gear and features a more streamlined, symmetrical profile all around. I can confidentially type on the iPhone 6 Plus with one hand using the Tough Armor case without feeling like it'll easily fall out of my hand. And if it does, suffice it to say that my heart won't sink like a brick knowing it is greatly protected against such an event. Needless to say this also applies to when using the iPhone 6 encased with Spigen's Tough Armor. And because of the obvious smaller form factor, the Tough Armor for the iPhone 6 is even more comfortable to use since it isn't as big and a tad slimmer. 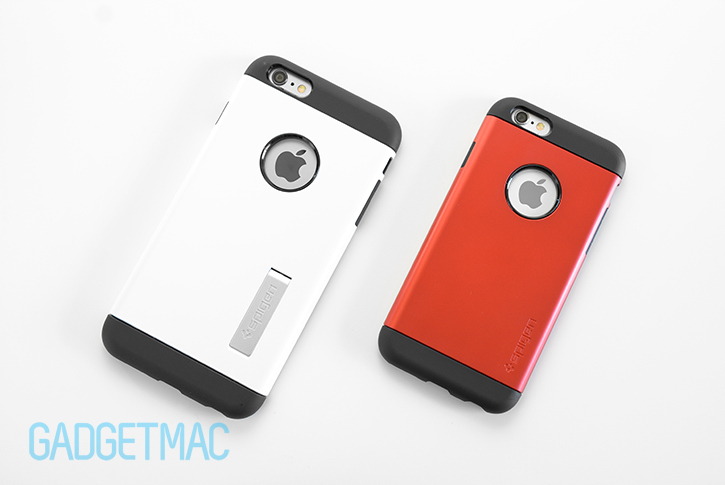 The Tough Armor and Slim Armor are in fact a two-piece cases but treated as a single piece when installing the case on the iPhone. Meaning the polycarbonate frame can be removed and replaced with a different colored polycarbonate frame, which is available to purchase individually from Spigen. Because there aren't any parts needing assembly, you can just pop in your iPhone 6 or 6 Plus into the Tough Armor or Slim Armor case with little to not effort whatsoever. But you should always insert your iPhone buttons side in first, while "snapping" in the rest of the phone into the case. Removing the iPhone 6 or 6 Plus from the case can be done with ease, and you'll find that it's much easier to simply push your iPhone out using that round Apple logo opening. Or you can proceed with pulling away the bottom corners first and the iPhone should then slide out. Like previous generations, inside the Tough Armor and Slim Armor cases is what Spigen calls the spider web patterned TPU layer, which supposedly provides superior drop protection and circulates the air around the back of the device keeping it more cool compared to other cases. Two things we really can't put to the test, but we do appreciate the effort of the design nonetheless. Spigen promises that the TPU used on the Tough Armor case won't stretch over time, and right away we can tell that the sides, bottom and top portions of the Tough Armor are absolutely solid and will not flex or bend away from the iPhone. And although the top and bottom portions of the Tough Armor's TPU material is more forgiving and can flex if pressure is applied by your thumb, we don't see any issues that would cause the case to sag or become less form-fitted around the iPhone. Unsurprisingly, not even a round protective film for the Apple logo is included given that the Tough Armor has a logo opening that exposes bits of the aluminum. Though the deeply recessed opening doesn't seem like it would cause any issues with scratching the exposed metal Apple logo. 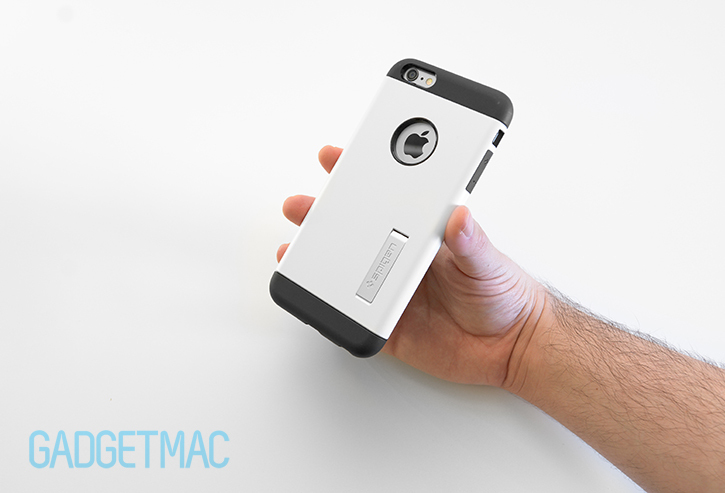 If you don't like the Tough Armor's blocky iPhone 5-like design, then there's also Spigen's Slim Armor case. It's the same dual-layer hybrid case with the same level of protection, but it's missing some of those Tough Armor attributes like the four corner raised rear feet that keep that hard polycarbonate scratch-free and the buttons aren't as defined. It even features the same circular Apple logo cutout around the back including the same metallic-looking dual angle kickstand that is found on the Tough Armor for the iPhone 6 Plus. The Slim Armor is a sleeker case overall with a polished black trim around the front of the device instead of an all-mate TPU material on the Tough Armor making it look a bit less dull. And while the Slim Armor case for the iPhone 6 and 6 Plus is less bulky to hold, it's also not very ergonomic feeling. There's no grip and the rounded edges of the case don't offer the same comfortable handheld usability as the flatter edges of the Tough Armor. It's even worse when using the iPhone 6 Plus version of the Slim Armor. Then again you may find the rounder design of the Slim Armor to personally be more appealing to you, and that's completely fine. What I also noticed with the Slim Armor case for the iPhone 6 in particular (not the 6 Plus) is that the edges of the case do not overlap the glass, which means you get to actually feel more of those curved glass edges of the iPhone 6 and that really makes up for an awesome user experience you don't get with other cases that Spigen makes such as the Tough Armor for example. The Tough Armor is one of the very few really tough cases that isn't without poise, an important part of what separates the atrociously clunky rugged case designs from the more comfortable and sensible designed cases that can still take a gnarly beating and still look good doing it. The Tough Armor offers a remarkable degree of all-around impact protection with its tried and true dual-layer hybrid design and air cushioned corners without feeling like a bulky OtterBox case. Although you won't be getting the same level of feel good grip as you would going with Apple's Silicone Case, you will enjoy some outstanding ruggedized yet very refined drop protection with Spigen's Tough Armor and Slim Armor series of semi-slim cases, and at a more reasonable price too. And yes, if you seriously have this question somewhere in the back of your head, the Tough Armor and Slim Armor cases will prevent your iPhone 6 Plus from accidentally bending. Because that’s apparently a thing that users with an iPhone 6 Plus have to worry about in addition to regular old drop protection. Worry not though, you shouldn’t consider a case like the Tough Armor simply because you’re worried about bending your iPhone as it isn’t likely to occur unless put under unforgiving, pin-point stress. There should arguably be only one reason why you shouldn't be using one of Spigen's Tough Armor or Slim Armor cases, and that's if you really dislike that submarine opening around the back that exposes the Apple logo. Because other than that the Tough Armor is a terrific case if you're looking to protect your iPhone 6 or 6 Plus against accidental drops, knocks and scratches. In fact, the Tough Armor is one of the best cases you can get for your iPhone 6 Plus right now that won't make it insanely bulky or overly unwieldy considering how protective it is. Make no mistake, encasing the iPhone 6 Plus with the Tough Armor case does increase its size quite significantly. But it's a necessary and unavoidable nuisance if you're seeking to protect your investment. That being said, the Tough Armor is relatively a very slim case when it comes to rugged cases. And if it isn't slim enough for you, then we think that Spigen's Slim Armor or even the more elegantly designed Neo Hybrid are both solid alternatives when considering a drop protective case. And if you've got an iPhone 6 Plus we would recommended getting the Tough Armor instead as it will provide a more secure one-headed usability. There's something about those flat sides that enhances the Tough Armor's usability making it feel better in the hand, and we appreciate the iPhone 5-esque familiarity that comes with. While we do like the Plus version of the Tough Armor's built-in kickstand, it is a little flimsy material-wise and that's disappointing. That said, it gets the job done and it's an extremely useful little feature to have when you're an iPhone 6 Plus user to say the least.